Pherozeshah Mehta (1845-1915) was an Parsi Indian political leader, activist, and a leading lawyer, who was knighted by then British Government in India for his service to the law. His political ideology was moderate and was hence not directly opposed to the crown's sovereignty but only demanded more autonomy for Indians to self-rule. 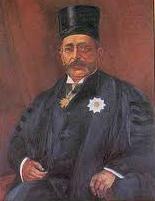 When the Bombay Presidency Association was established in 1885, Pherozeshah Mehta became its president, and remained so for the rest of his years. He encouraged Indians to obtain western education and embrace its culture to uplift India. He contributed to many social causes for education, sanitation and health care in the city and around India. Pherozshah Mehta was one of the founders of the Indian National Congress and its President in 1890, as its president he presided over Indian National Congress session held in Calcutta. In 1910, he started Bombay Chronicle, an English-language weekly newspaper, which became an important Nationalist voice of its time, and an important chronicler of the political upheavals of a volatile pre-independent India.